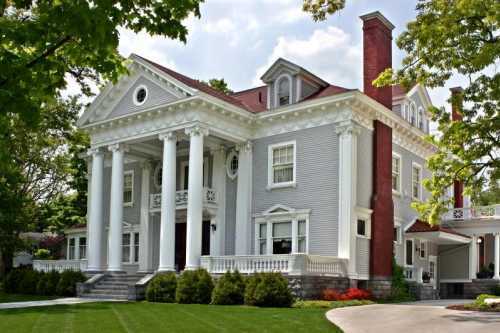 Whether you're socializing with other guests or enjoying a glass of wine on this magnificent porch, take in the neighborhood charm of one of Traverse City's finest historic districts. Nine guest rooms plus two 2-bedroom carriage house suites in authentically-restored, neoclassical mansion. Private baths, A/C, wireless Internet, non-smoking. Breakfast served in turn-of-the-century dining room. Walk two blocks to downtown beaches, restaurants, shopping. Elegant ballroom for meetings and special events. Guest kitchen with complimentary refreshments. Summer rates: $205 and up. Winter rates: $180 and up.